Digital Certificate Program – Tuesday, March 13, 3:30 – 5 PM in starts in Timmerman with food/networking to follow. Companies will include: AcuRite, Logical Position and Rocket Clicks. This entry was posted in Events, For Students, Jobs, News, Other and tagged AMA, career, certificate, Digital Certificate, digital marketing, jobs, marketing, networking, News, sponsors, student orgs on March 13, 2018 by jhilluww. Spring semester is in full swing at UW-Whitewater and for the Department of Marketing! Our February edition of the Department of Marketing Newsletter highlights recent achievements and our student, faculty and sponsor spotlights. Marketing and Sales Career Fair – 29 companies participated with job and internship opportunities! Perfect Pitch Sales Competition – Approximately 170 students participated and $2550 was awarded in prize money from our sponsors: Consolidated Electrical Distributors and Impact Networking. Partners in the Classroom – students interact one-on-one with representatives from our sponsoring companies. Student Spotlight – Jason Precia, most recent recipient of the Richard Telfer – AMA Minority Business Student Scholarship. Faculty Spotlight – Yushan Zhao, Professor and Chair of the Department Assessment Committee. Partner Spotlight – Brian Robinson and Jason Gardner from C.H. Robinson. Congratulations to the AMA/sales students for an outstanding performance at the UNLV AMA Western Regional Collegiate Conference held at the University of Nevada, Las Vegas on Jan. 27. Click here for the full story. UW-Whitewater AMA/sales students pose in front of the University of Nevada Lee Business School during the competition. Back row, from left, Haley Lechner, Cameron Neuhauser, Kelsey Berchem, Katie Hart, and Trevor Raasch; middle, from left, Matt Young and Sam Wanezek; and in front, Kelly Deschner. And we have a lot more coming soon! If you would like to be on the mailing list for our Department of Marketing Newsletter, have any questions about our program, or need more information, please email Editor-in-Chief and Department Assistant, Julie Hill, at hillj@uww.edu. This entry was posted in Events, For Students, News, Other and tagged achievements, AMA, American Marketing Association, awards, career fair, competition, competitions, job, jobs, marketing, networking, News, newsletter, Partners in the Classroom, Perfect Pitch, sales, sponsors on February 20, 2018 by jhilluww. Direct Supply will be hosting an Express Interview Night on Thursday, October 8, 2015. If you’re looking for a job or an internship, check out the invitation below! Please join us on Thursday, October 8 from 5:30pm to 7:30pm for Express Interview night at Direct Supply! Express Interview night will feature full-time positions listed below that require 0–5 years of experience and internships that require a minimum of 2 semesters of school remaining. You will have the opportunity to interview with multiple hiring leaders for roles that have both immediate openings and openings for December graduates. What can I expect? Arrive anytime between 5:30-7:30pm and you will have the opportunity to interview with multiple leaders for 10 minutes each. There will be light appetizers and refreshments, and members of the Talent Acquisition Team will be available to answer your questions about Direct Supply. What roles will be featured on October 8? What do I need to do? Review the roles listed above at DirectSupply.com/Careers and RSVP to Rachel Beckman (RBeckman@directs.com, 414.760.5865 ) with your resume and positions of interest by Monday, October 5. Once you send your resume, we will be expecting you on October 8. After you RSVP, you will receive directions to Direct Supply and additional details to prepare you for the event. Please reach out with questions. This entry was posted in For Students, Internships, Jobs and tagged Direct Supply, internships, interviews, jobs on September 28, 2015 by uwwmarketing. 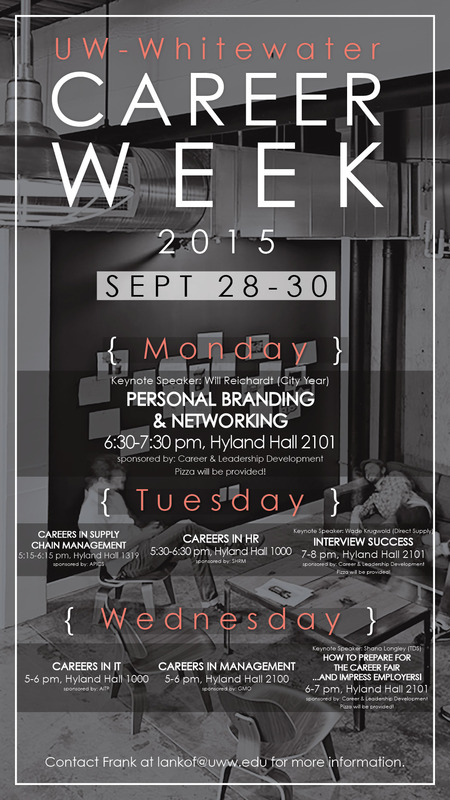 This entry was posted in Events, For Students and tagged careers, interviewing, jobs, networking, personal branding on September 28, 2015 by uwwmarketing. Now that we are on the home stretch to graduation, and you are overwhelmed with group projects, here is some good news… Interviewing should be EASY! Interviewing is a predictable and repeatable process that you can control to highlight your core competencies. It can be FUN too! OK, first you have to find out if this is a company you want to work for. Do your research online. Ask questions that you have previously written down about corporate culture—what employees at this company like most and least about their jobs. Ask these questions early in the interview process. Be courteous – make eye contact, thank the interviewer for their time during the interview and after via a hand written thank you note. Illustrate a strong work ethic – whatever the position, if you have had passion and retention in your jobs prior to graduation, talk about that. Also, talk about how much of your education you have paid for. Be aware of current global events and highlight any travel abroad experience that you have. Global awareness will put you in the minority in terms of understanding the world outside our university walls. Talk about your internship – although internships are not required in many majors, they are one of the first things you will be asked about. Do an internship through the university with a faculty advisor that will assess your work with intern-specific assignments. One of the biggest benefits is the formal evaluation your supervisor will provide you that you will always have as a testament to the problem solving and value you provided to them. Remember, you are interviewing to provide benefits to your employer, so have two additional examples of coursework that illustrate your problem solving ability. So, make some notes, bring them to your interview, listen, be engaged and passionate and ask about next steps. This entry was posted in For Students and tagged careers, internships, interviewing, jobs on May 17, 2015 by uwwmarketing. Next week is the CoBE Multicultural Career Fair! Approximately 62 employers will be in attendance to talk to students about full-time job opportunities and/or internships for Summer 2014. This is the last on-campus recruiting event this school year, so you don’t want to miss it! All students and majors are welcome, but business or business casual attire is required. If you have any questions, please contact Freda Briscoe at (262) 472-3216. The CoBE Multicultural Career Fair is sponsored by the College of Business & Economics and Career and Leadership Development. This entry was posted in Events, For Students and tagged careers, interviews, jobs on January 31, 2014 by uwwmarketing. Career & Leadership Development is sponsoring an Etiquette Dinner for students this semester. The event is being offered to students who would like to polish their etiquette and dining skills in preparation for interviews that include a meal. A professional from Catering Services will be presenting etiquette information and guidelines, walking attendees through each course of the meal. Various employers, faculty and Career & Leadership staff members will serve as table hosts. Time will be allowed between each course to converse with these individuals and practice your professional communication skills. Students who wish to attend should stop by the Career & Leadership Development Office (University Center – Room 146) between February 3rd and 17th to sign up. Please stop by between 8am and 4:30pm. Questions? Contact Career & Leadership Development at (262) 472-1471. This entry was posted in Events, For Students and tagged careers, interviewing, interviews, jobs on January 29, 2014 by uwwmarketing.